The container of canoes from China has no parts in it. The Box store certainly stocks no parts. When your seat and deck plate breaks or you lose the hatch no replacements are available. Shop at the box stores and you'll find you're on your own both before and after the sale. Hoping that you've made a good choice rather than knowing you've bought the best value for the priorities you have and the waters you want to explore. Just like for the last 40 years, Oak Orchard has parts in stock for the brands we recommend and sell. We can repair the canoe you bought from us and get you back on the water. Just like for the last 40 years, we can phone our rep (a real live person) at Old Town, Mad River, Wenonah or Sportspal and get service and parts for you. We get calls all the time from people trying to find parts for those "unique" box store canoes, unfortunately parts are just not available, anywhere. What will you do WHEN your seat, yoke or backrest BREAKS ? We call them "white elephants"; cheap box store canoes which turn out to be a costly mistake and provide a hobby of frustration rather than fun." AND... knowledgeable sales people that spend the time to help you buy the right kayak the first time. ROYALEX; quality and reliability is very similar from one brand to another since all brands buy their Royalex from one place. Royalex is a multiple layer abs based plastic well proven over decades of use. The layers are fused together providing outstanding flexibility on impact and outstanding longevity and overall hull shape retention. NOTE; the company that makes ALL the Royalex material for MAD RIVER and ALL other canoe brands has stopped production. Royalex is great material for canoes which we have sold and also used in our rental program for many years with great success. 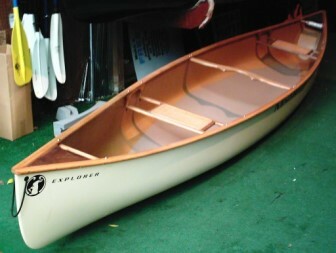 The time to purchase is now while we still have a FEW Royalex canoes available. 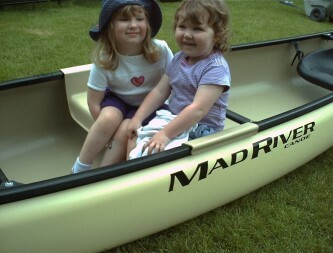 Mad River, Old Town and Wenonah Canoe all make quality Royalex canoes. PLASTIC (polyethylene); quality and reliability varies greatly from one brand to another depending on the grade of plastic used and the way it's formed. Single layer plastic canoes dominate the box store scene since they are the lowest price of any option. Quality ranges from disposable trash can grade to a bit better. Multiple layer plastic canoes are about four times thicker and provide very good shape retention, and durability over many years. Extra thickness results in much fewer catastrophic failures from cracks and voids which become leaks in a single layer canoe hull. Unlike single layer canoes which need molded seat supports between the gunwale, multiple layer canoes have replaceable seats and components. We have sold and also used multiple layer plastic canoes in our rental program for many years with great success. Examples of multiple layer plastic are Triple Tough by Mad River, Polylink3 or Crosslink3 by Old Town and Three-phase rotomold by Wenonah Canoe. Fiberglass, Kevlar and carbon (composites); quality and reliability varies greatly from one brand to another. Reliability depends greatly on the grade of material or fabric used and the way it's formed and reinforced. Quality ranges from very poor to outstanding. Multiple layer canoes with a core material in the floor are about four times thicker and provide very good shape retention, and durability over many years. The canoe world is full of one year wonders and hucksters that only talk a good game. Oak Orchard only recommends canoe models which are proven in real use. Examples of good composite canoes include Mad River (fiberglass), NovaCraft (bluesteel, tough-stuff, fiberglass) and Wenonah Canoe (tuff-weave, Kevlar, carbon). and safety at a price that appeals to both the entry-level paddler and those looking for a second family canoe. Its unique multi-chine hull design provides excellent stability, rigidity and tracking. superlinear polyethylene which provides high durability at a low price. Outfitting includes two Comfortable padded seats with padded backrests, a center seat and numerous drink holders and work surfaces are provided for the paddler on the go. Go ahead; check out the box stores. Then come to Oak Orchard; we stand behind the canoes we sell with warranty, parts and knowledgeable service. Adventure 14 single layer poly 14' 37" 33" 34" 75 lbs 875 lbs 14.5" 21" 18"
at a price that appeals to both the entry-level paddler and those looking for a second family canoe. This is the Square stern model which has a built-in transom plate so you can either paddle OR clamp-on your motor and GO! Adventure 16 square stern single layer poly 16' 37" 33" 34.25" 84 lbs 950 lbs 14.25" 19" 16.75"
Mad River's Explorer is world famous for durability, stability and truly verstile performance. Jim Henry's original Explorer design is a benchmark when it comes to versatile canoes. and grinds that accompany just about any canoeing adventure. seaworthiness and superior paddling performance make this canoe as close to an all-purpose canoe as you'll get. Explorer 16 Royalex 16' 36" 36" 34.5" 1100 lbs 72 lbs 14.5" 21.25" 21"
get good durability at a low price - the only compromise is weight. Polyethylene is heavier than most Royalex or Kevlar composites. It's a good choice for the paddler who needs a canoe that's seaworthy, stable and maneuverable. or streams and makes a very stable platform for family outings. Explorer 14 TT Triple Tough 14' 6" 36" 36" 34.5" 850 lbs 72 lbs 14.5" 22" 21"
Available in two materials for your budget minded solo paddler. SERENADE; [Fiberglass construction] sliding CSS seat with backrest, 2 ash thwarts, 2 ash carry handles, footbraces, aluminum gunwales. SERENADE; [economy Kevlar construction] sliding Wood seat, 2 ash thwarts, 2 ash carry handles, footbraces, aluminum gunwales. Serenade Fiberglass 13' 1" 28.25" 28.25" 26.5" 300 lbs 42 to 50 lbs 11.5" 16" 13.5"
Serenade economy Kevlar 13' 1" 28.25" 28.25" 26.5" 300 lbs 30 to 40 lbs 11.5" 16" 13.5"